The Boy Scouts of America annually celebrates its founding on February 8, 1910, based on the program started by Lord Baden Powell in England on August 1, 1907. Scout Sunday was added to the Scout celebration in the middle 1940s. Scout Sunday is always the Sunday preceding February 8th, unless the 8th is a Sunday, in which case the 8th would be Scout Sunday. 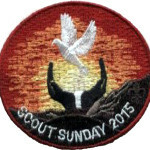 Once again, we have a cool patch for all the Scouts that attend. We will be attending the 11 a.m. service at Gloria Dei Lutheran Church on February 8, 2015. We can pick up carpoolers at 10:15 a.m. at the old Fire Station. We will be going out for lunch afterwards. If you plan on going, please RSVP on the right.